The Sweet Spot: Hola and Hello! It's GREAT to be back! I had a wonderful summer that went by all too quickly. I can't believe it's September. It feels like yesterday I was looking out the window on a June day realizing that I couldn't be stuck in this house and I had to get out. I'm very happy I took my little 3 month "sabbatical". It was great not to be worried about any e-mails or electronic devices. I think I've learned that I need to be more balanced and I am grateful for that. Anywho, I went to the beach more times this summer than any other summer I can recall. We went to visit my mother-in-law for a few days in Raleigh, NC and I got to take a dip in the pool at her complex. I can't remember the last time I had been in a pool. Oh yeah, it was 2008 in Puerto Rico. Eesh, time is not on our side peeps! There was an earthquake (more like a tremor) here in NYC and the same week we had a hurricane. HA! Never a dull moment. I'm happy and thankful that nothing happened here at Casa de Diaz. All we got was a tiny puddle in our basement. Nothing the wet vac couldn't take care of. Well, I have been a busy bee these past few weeks. The boys stayed in NC with their grandma to enjoy the pool more and I decided to take advantage and create to my hearts content without any "mommy, I'm hungry" or "mommy, I'm bored" breaks. I've been silently stocking my shop up with new goodies. Not so much in the quilling department but all paper related for sure. Here's a tiny sneak peek but I invite you to stop by the shop and check it our for yourself! I went hair pin crazy!! Lots of new paper blossom rings. New paper goodies for your office. So, there you have it. There are a few giveaways slated to start today. I will give details very soon. I hope you all had an amazing summer and I look forward to catching up with you all! May the SWEET be with you! you've been busy, very nice and creative, love them!!! 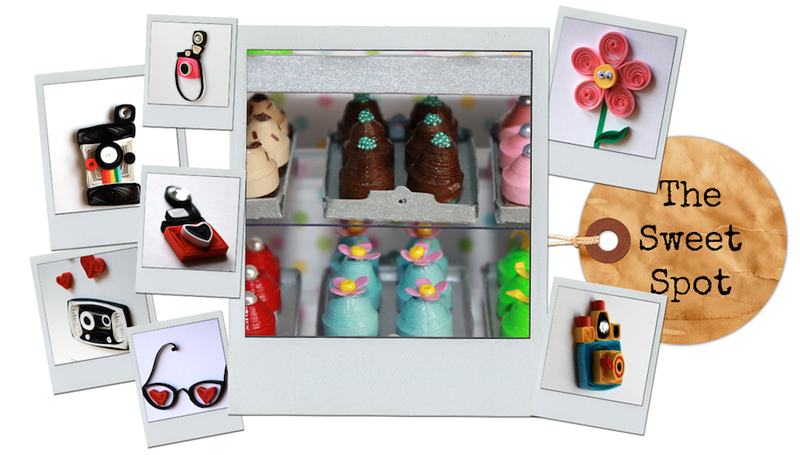 Stopping by from Polka Dot Bungalo giveaway...I love your camera cards and hair pins!!! New follower!! Welcome back! So many beauties you created! Love them all! Especially the flowers!